Hinshaw, Solomon, age 28, born in North Carolina; farmer & head sawyer. Hinshaw, Elizabeth, age 21, born in Indiana; keeping house. Hinshaw, Rachel E, age 2, born in Indiana. Henshaw, Soloman, age 38, born in North Carolina; parents born in North Carolina; farmer. Henshaw, Elizabeth, wife, age 31, born in Indiana; father born in Ohio; mother born in North Carolina; keeping house. Henshaw, Rachel E, daughter, age 12, born in Indiana; father born in North Carolina; mother born in Indiana. Henshaw, Edwin M, son, age 9, born in Indiana; father born in North Carolina; mother born in Indiana. Henshaw, John L, son, age 5, born in Indiana; father born in North Carolina; mother born in Indiana; sick: measles. 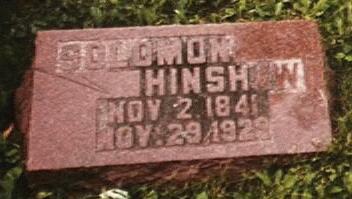 Hinshaw, Solomon, head-of-household, age 58, born Nov 1841 in North Carolina; parents born in North Carolina; married 33 years; owned farm (mortgaged). Hinshaw, Elizabeth, wife, age 51, born Mar 1849 in Indiana; father born in Ohio; mother born in North Carolina; married 33 years; 3 children, 3 living. Hinshaw, Solomon, head-of-household, age 68, born in North Carolina; parents born in North Carolina; first marriage, married 42 years; occupation: farmer, general farm; owned farm (free). Hinshaw, Elizabeth, wife, age 61, born in Indiana; father born in Ohio; mother born in North Carolina; first marriage, married 42 years; 3 children, 3 living. Hinshaw, Solomon, head-of-household, age 78, born in North Carolina; parents born in North Carolina; owned farm (free); occupation: farmer, general farm. Hinshaw, Elizabeth, wife, age 71, born in Indiana; father born in Ohio; mother born in North Carolina. "Chronology of the Beals family" by Thomas J. Beals, microfiche #6048746 in the LDS Family History Library. 1880 census, Washington Township, Hamilton County, Indiana; roll T9-281, ED 38, page 400D, line #24, dwelling #320, family #340. 1870 census, Westfield P.O., Washington Township, Hamilton County, Indiana; roll M593-319, page 219B, line #11, dwelling #632, family #620. Edwin Michael Hinshaw death certificate. "Additions, Corrections, & Comments - Abstracts of the Record of the Society of Friends in Indiana", by Roger S. Boone, 1978, Springfield, Ohio; In the Newberry Library in Chicago. Contribution from Robert S. Hinshaw citing: gravestone. 1900 census, Washington Township, Hamilton County, Indiana; roll T623-375, ED 91, page 10A, line #37, dwelling #234, family #237. 1910 census, Washington Township, Hamilton County, Indiana; roll T624-353, ED 110, page 2A, line #34, dwelling #24, family #24. 1920 census, Washington Township, Hamilton County, Indiana; roll T625-435, ED 110, page 4A, line #8, dwelling #43, family #43. 1880 census, Washington Township, Hamilton County, Indiana; roll T9-281, ED 38, page 400D, line #29, dwelling #321, family #341. Photo from the book "The Hinshaw and Henshaw Families", 1911. Photo courtesy of Robert S. Hinshaw.